So tasty! So healthy! So PRETTY! The DH has never been to a Pick-Your-Own farm, at least not in Canada, so I figured it was high time he experienced the fun that is sweating in the fields. I find that the further you drive out of the city, the cheaper the PYO prices are, but the DH, my sister, and I only wanted a half-day jaunt, so we didn’t drive too far. As such, the cost of the PYO was actually roughly on par with what you’d pay in a store. So why did we do it? Well, aside from the novelty factor (and yes, I recognize that only a city kid could say that), it makes for a shorter distance between farm and table. You pick the fruits and vegetables at their peak, as opposed to having them picked before being fully ripened and then being either falsely ripened in a facility, or just never fully ripened. So it’s healthier and more nutrient-rich! And, when it comes to strawberries at least, also tastier! The family and I picked autumn strawberries (did you know there was such a thing? ), green beans, and baby eggplants. I like to store strawberries in the freezer so that in the winter I can make delicious fruit dishes without having to pay through the nose (what an expression!) for fresh ones from out of the country, or frozen ones with the prices jacked up. 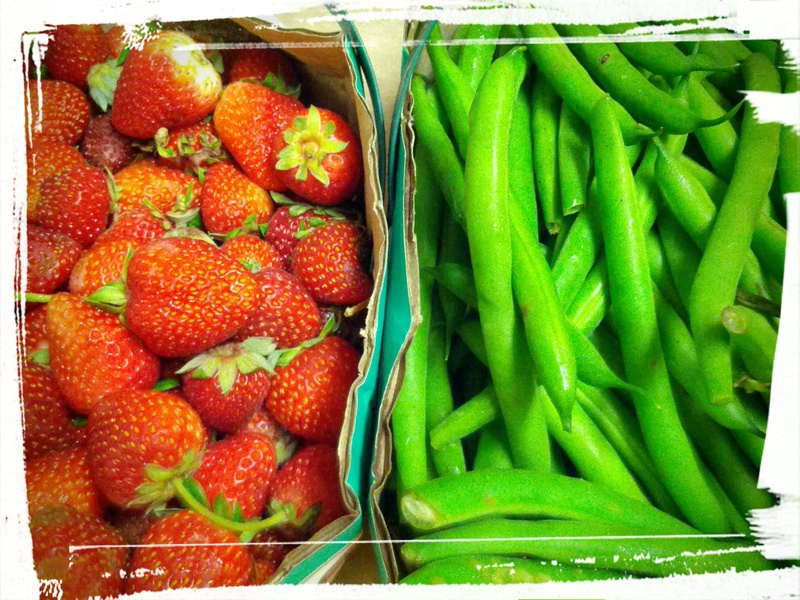 So, today I’m going to show you how to freeze your strawberries and blanch your beans for freezing! First things first…show me the produce! Oh, the strawberry dishes I’m dreaming of! 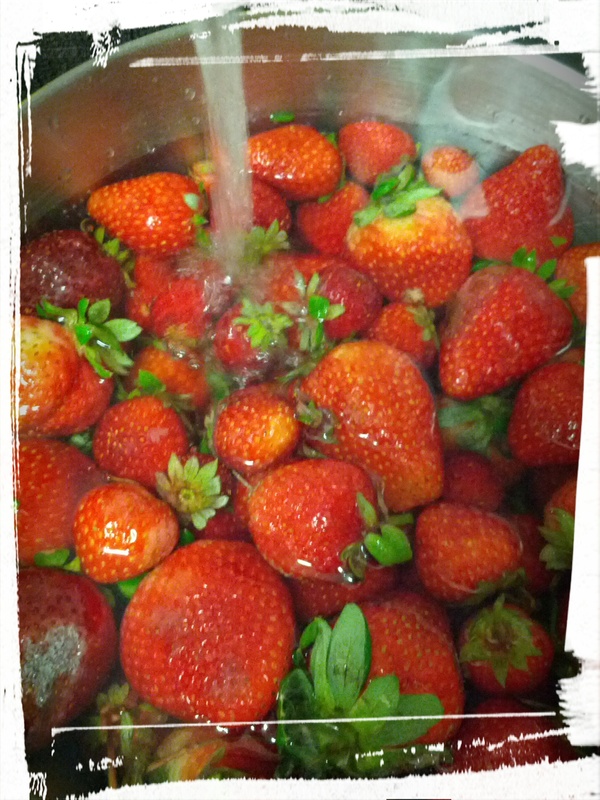 Wash and de-leaf (and possibly hull) your strawberries. Place on cookie tray in freezer until semi-frozen. Place semi-frozen strawberries in freezer bag. Label. Done! Luxuriate in your pioneer prowess! And now on to the beans! Let’s get blanching! Wash beans and snip off the ends. Cut in pieces if you want. Boil water and dump beans in water for 2-4 minutes. 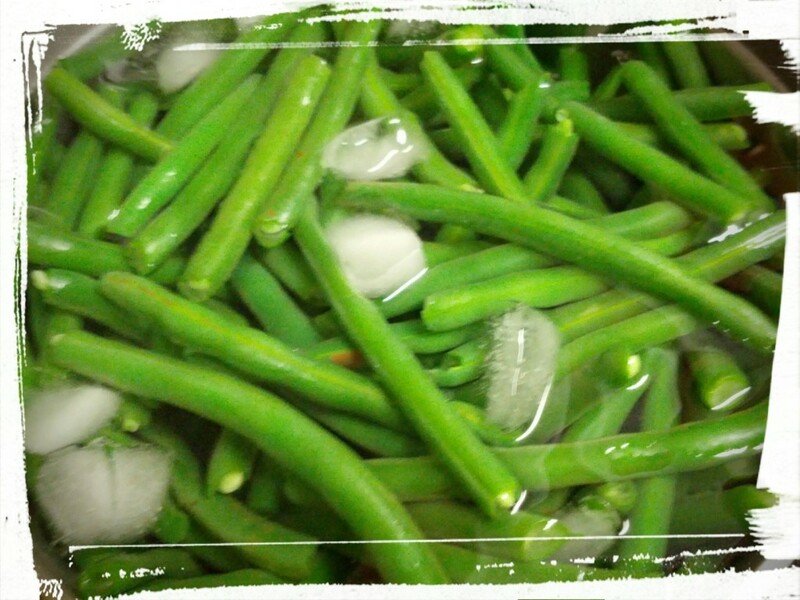 Drain beans and dump into container of ice water. When cool, drain and place in freezer bag, making sure to empty out all air. Label. Done! Boast about your homemaker skills on twitter, because everyone should know just how hard you work! And…that’s it! It’s really not that hard. It’s a good feeling to know that you’ve put up fresh produce; when you pull it out of the freezer, you remember the day you picked it. What happened to the eggplant I picked, you ask? Well I’m not really sure how to preserve it. So I’ll likely just sauté it in some oil with a dash of sesame oil and eat it as a side dish. Mmm…I do love me some eggplant. When it’s done properly, the bitter juices have been drawn out and the sugars caramelize and make a luscious dish. Maybe I’ll make some now! What’s your favourite way of preparing eggplant? Let me know in the comments! 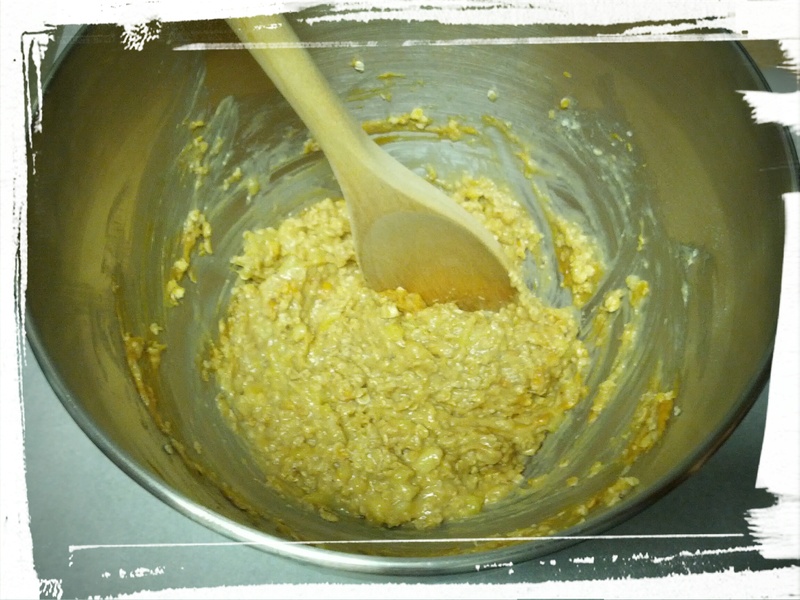 Next Post: Most likely the promised Oatmeal Substitution Bread. Or a Salsa Smackdown. We’ll see what I’m craving tomorrow! This entry was posted in Preserves on September 30, 2014 by Margaret. Actually, it’s not hard at all. Check out this link to find out how to make your own. I will say, make sure to cut the dough finely, as it will become more dumpling-esque the thicker the strands are. And serving them in a homemade broth elevates the noodles from strands of carbs to an actual dish. The verdict: would I make them again? Well, the DH really enjoyed them, and even took the leftovers for lunch the next day, but they weren’t my favourite. I’m sure I’d make better ones with more practice…but they’re so easy to buy at the grocery store! So I probably shadn’t make many more batches. I will try to perfect my pasta-making skills using my pasta-maker attachment for my mixer, but that’s another post for another day. Next Post: Bread from Leftovers, and why I’m all about the substitutions. 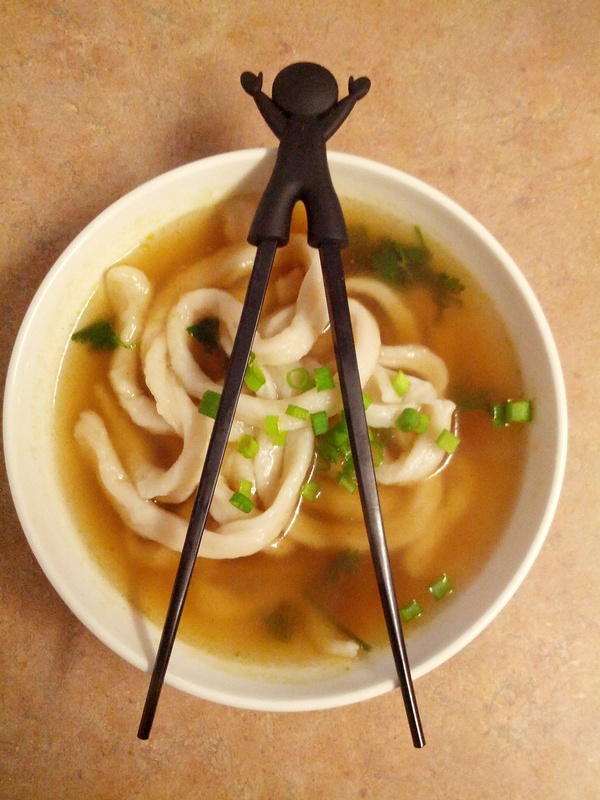 This entry was posted in Memories of Meals Past on September 26, 2014 by Margaret. So fluffy they might float away. I woke up this morning and made the DH some sour milk pancakes, as a thank you for transferring my 10kg bag of flour (I kid you not) into smaller and more manageable containers. I think I use about two of those bags a year, plus significantly less whole wheat flour. I try to enrich it by adding in freshly ground flax and I probably should use less white flour, but a whole wheat pie crust just doesn’t taste the way I like. I did come across the most interesting flours on kickstarter yesterday, but they’re not in full production yet. I used to whip these pancakes up a lot when I lived with my parents, because I could dump all the ingredients in the blender, fry up the pancakes, eat them, clean up, and freeze the remaining pancakes for future breakfasts, all in 30 minutes. They’re that easy! Place milk in a cup. Add vinegar. Dump everything else into the blender. By this time, the milk should be chunky. Dump it in as well. Blend until mixed. 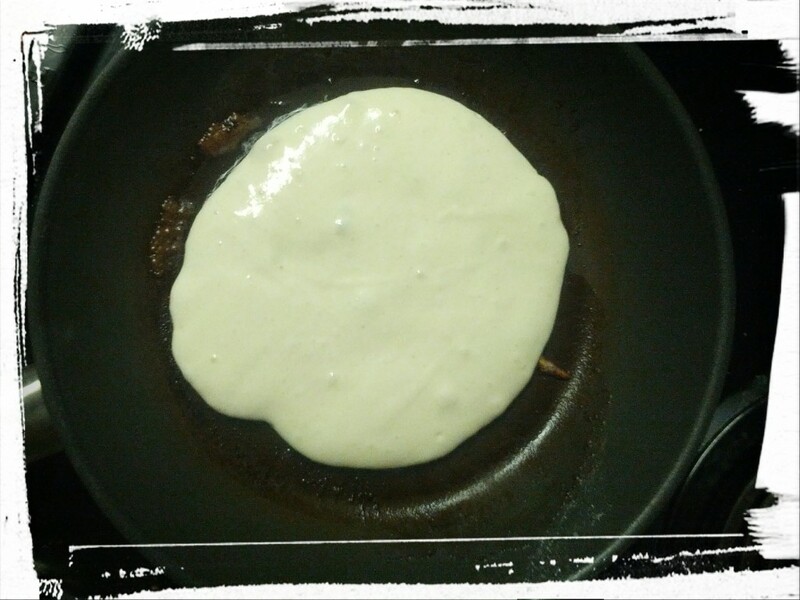 Pour into a hot griddle, greased with butter. You may need to spread the batter out, as it’s quite thick. Fry until bubbles appear and flip to fry on other side. Repeat until batter is gone and stomach is full! If you want to freeze them, you can easily defrost them by sticking them in the toaster. Homemade pancakes, easy as toasting bread! I used to let them cool on a cookie cooling rack, and then just stack them in a plastic container in the freezer. I used a large griddle when I made these at my parents place, as I could cook the entire batch at once. I used very little butter to fry them, as I was trying to make them lower in fat, but I have to say, more butter makes them better! They’re tasty with fruit or syrup, or whatever your favourite topping is. Let me know in the comments what your fave pancake topping is! This entry was posted in Breakfast Foods on September 24, 2014 by Margaret. Rocky, my new hiking buddy. 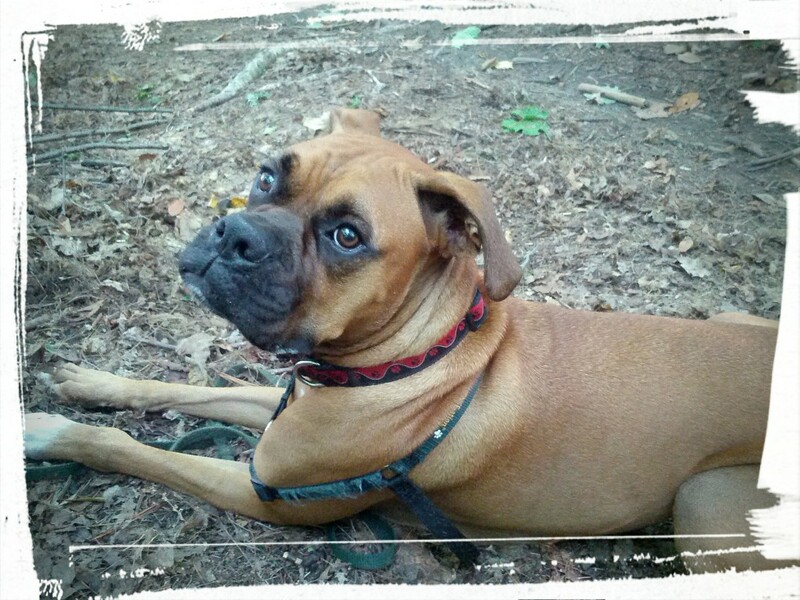 I wanted to tie my day’s activities into this post, because I went on a great hike with a new hike buddy (see pic above) and his owner, ate homemade whole-wheat pizza and chocolate-covered pretzels, and topped my day off being all creative and quilting and then read 200 pages of my latest book club book, but couldn’t find a way to tie it all in. So…on with the non sequiturs and disjointed paragraphs! Speaking of which… I used to be a raw foodist. I have GI issues and until the doctors finally figured it all out a couple of years ago, I had chronic stomachaches and related discomfort. You might think it was salad in the morning, salad all through the night! (sung to the tune of Fever!) But it was actually wayyyy more delicious. This was just before Rawlicious and company sprawled prolifically across Toronto, so I had to learn to cook (or not) a whole new way. Raw food means just that, raw food, so there was no heating food above around 45 degrees. The theory is that cooking kills off healthy and necessary enzymes. I just wanted my stomach to stop hurting. And it did! Raw food means high fiber, high water content, and eating every few hours because it gets digested quickly. After the first couple days of being hungry, it was easy. I should say, hungry-ish. I transitioned *cough* cold turkey *cough* to raw food during a stressful period in my life and I’m one of those people for whom high stress kills appetite dead. It’s hard to be hungry when your stomach is a cold hard lump of dread. Anyway, once that resolved, I guess my body was used to the lack of refined sugar and flour, so I didn’t really have any cravings that couldn’t be satisfied with dried medjool dates. Until I visited a friend in Nova Scotia, and my system got reintroduced to bread. Then I craved bread constantly. But before that! The pounds dropped off like magic. And I had more energy and felt overall better. This coincided with a period of my life where I was hyper-fit, so you know, chicken, egg, correlation. I stopped being a raw foodist after I spoke with a GI specialist and he was able to pinpoint exactly why not all the issues had resolved. These days, on a diet high in salad, fibre, micro-meals, and lactose-free probiotic yoghurt, my symptoms are mostly under control. Thank goodness! Because gastric distress and vaso-vagal reactions do not make for fun times. Tara, a talented, clean-cooking, glowing-skinned colleague, who spoils us all with her home-baked goods on a regular basis, has kindly given me permission to share this with you (she rocks!). 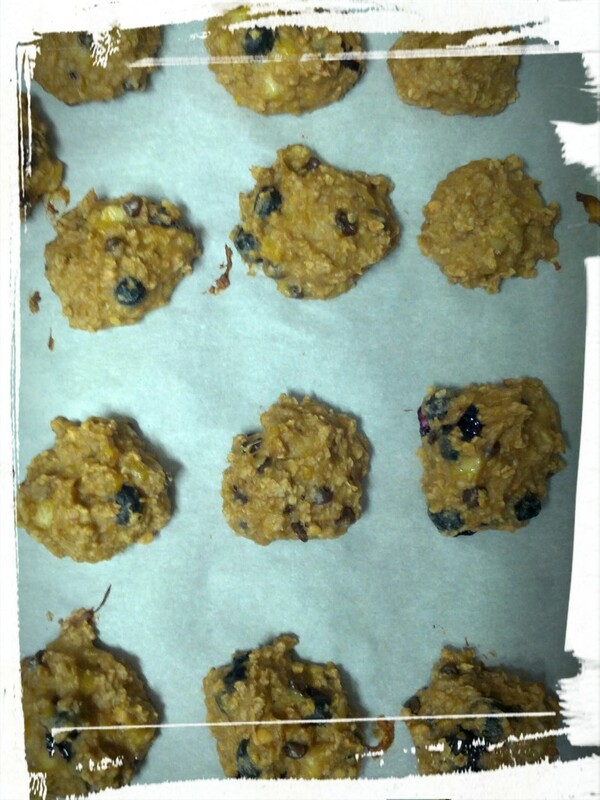 Mix all together and spoon onto a piece of parchment paper on a cookie sheet. Bake for 15 minutes at 350 degrees and cool. (The energy bites will still look a bit damp. That’s ok.) Eat. Revel in your health! 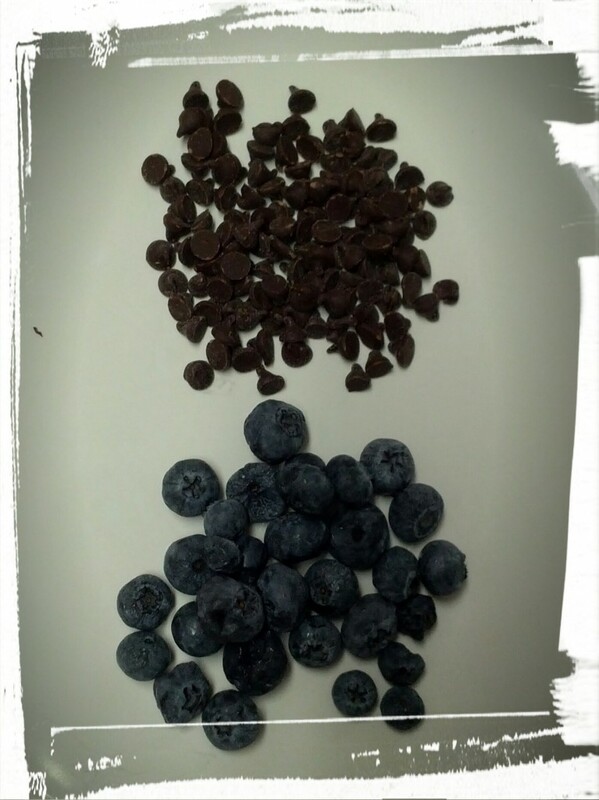 The age-old question: chocolate chips or blueberries? They are so yummy! You won’t believe that they’re super wholesome and nourishing because they taste so darn good! (Even to processed sugar and flour addicted taste-buds). I thought about using carob chips in here to up the wholesome factor and my vegan cred, but decided to go hog-wild and use real chocolate and blueberries. Tara says that substitutions work really well with this recipe, and suggested quinoa flakes instead of the oats, or adding dried fruits and fresh fruits such as raspberries. Mmm…. Yummy bites of healthy energy, get in my stomach! The DH is snacking on these as I type. WIN! 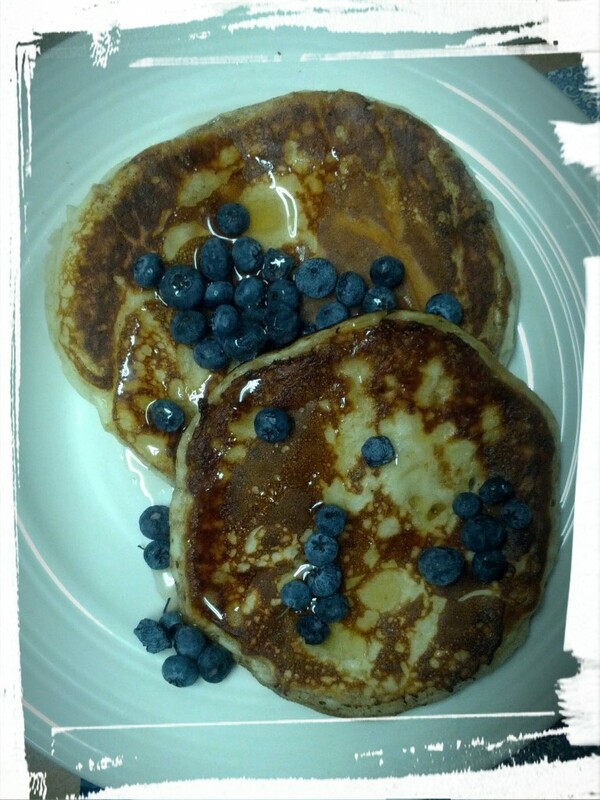 Next Post: Toaster Pancakes and why chunky milk can actually be A Good Thing. This entry was posted in Snacks on September 22, 2014 by Margaret. Fry me like your French fries. Better yet…bake me. So the apple pie that I made in the (second) last post? Is gone. I ate it. The DH may have had a single slice. Literally, one slice. But it was just so good! He found out that it was gone when he woke up this morning and wanted to pack a slice for lunch but only found the empty pie pan. (Je ne regrette rien!) I told him I’d be happy to make him another one, or to make an apple crumble, which he prefers, but he said he wanted something healthy. And then I came home tonight and I had a craving for carbs. And vegetables. 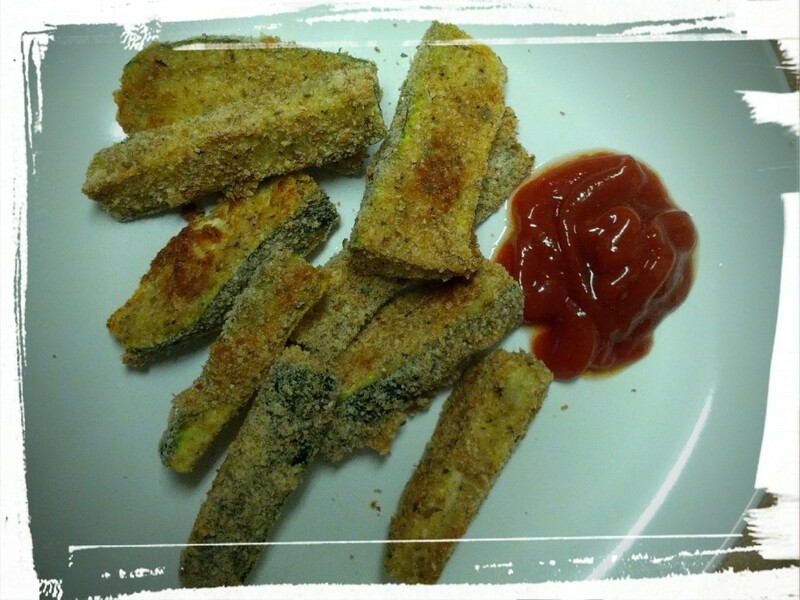 I also had some zucchini in my fridge that I wanted to use, so dinner tonight starred my oven-baked zucchini fries! They’re healthy, super-low in fat, and more fun than eating steamed zucchini. The DH has gone to buy some more apples, since I baked all the ones we had into that scrumptious pie, and he’s looking forward to eating the zucchini fries when he comes home. He may want to get home quickly, because they’re awfully good! Cut zucchini in three. Take each third and cut into 6 pieces. 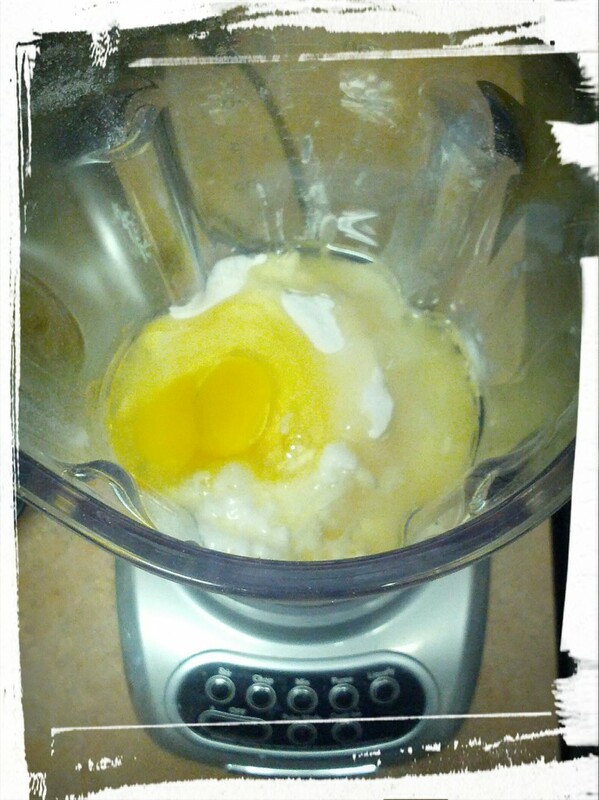 Beat an egg white in one bowl. In another bowl, mix bread crumbs and spices. 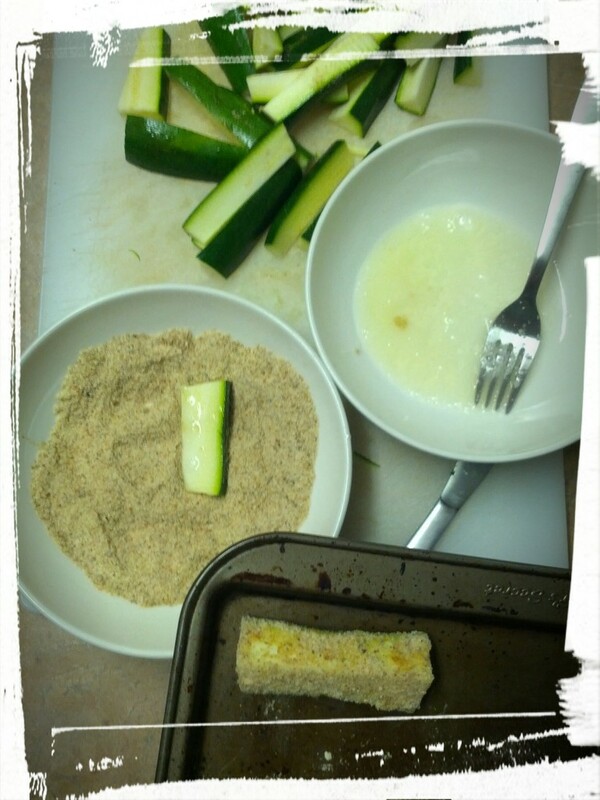 Dip each piece of zucchini in the egg white and then in the bread crumb mixture. Place on a greased baking sheet. Bake in a pre-heated 350 degree oven for 15 minutes, then flip them over and bake another 15 minutes until golden brown and soft when pierced with a fork. Eat, and quell those fry cravings! Easy peasy. This pic says it all. I have to say, these aren’t exactly like FRY fries, obviously. But they’ll do in a pinch! There’s a solid kick of heat that you don’t expect when biting into it, and somehow that ties it all together. Even the DH, who dislikes any sort of spiciness, gobbled these up! Next Post: Vegan Chocolate Chip PB Banana Bites and why I used to be a Raw Foodist. 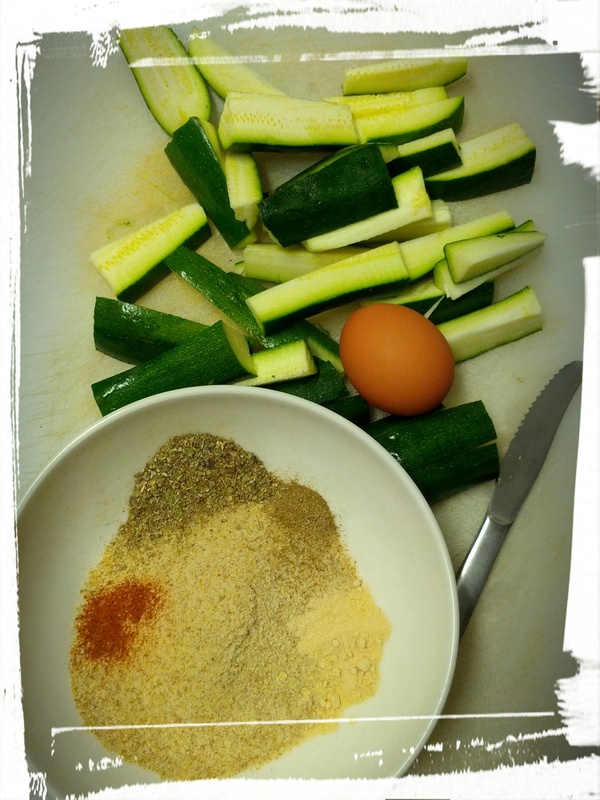 This entry was posted in Vegetarian Side Dishes on September 19, 2014 by Margaret.